Michaela: What got you into music and playing with the Red Hot Chilli Pipers? Willie: My grandfather played the pipes in the army during the war. He was ferociously proud of his nationality and played them constantly. Apparently the Germans never shot the Pipers as they quite liked the music and they thought (for fairly obvious reasons) that the Pipers were mad. When I was wee, I just fell in love with his music, I often wondered how sometimes it would make me feel melancholy and sometimes I’d be up and dancing around with him even at a very young age. I realize that not everyone will get the sound the bagpipes make and I believe they have to be played really well and tuned really well or it will sound like a cat getting strangled. It’s a very fine line between having your ears murdered and being truly entertained. 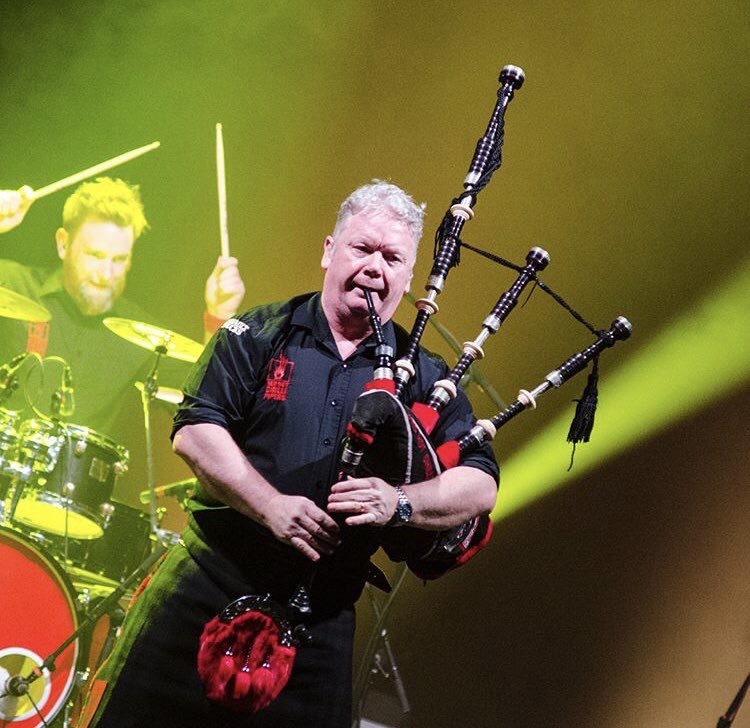 The Red Hot Chilli Pipers is an extension of the entertainment because I make sure every single band member is a virtuoso musician in their field, on our stage there is absolutely nowhere to hide. Michaela: How much work goes into covering a song so that the sounds of bagpipes, tin whistles, bodhrán, and the other instruments work with the original structure of the song? Willie: You’d be surprised. Again there’s a fine line. You can’t cheapen it by throwing any tune in. That’s basically karaoke bagpipes and that’s far from difficult. You also need to stay true to the tradition so we make it 50/50. Half will be cleverly played recognizable rock tunes and half will be traditional reels, horn pipes and jigs. The set list is constructed in such a way that the audience will be on the edge of their seats from start to finish. Michaela: Being well acclaimed worldwide, you’ve had many opportunities to meet a variety of people from everywhere; is there a story of a meeting that still stands out to this day? Willie: Yes, we were playing a big charity gig in London and all the A-list celebs were there. I was standing with the band but was on my phone to my wife Anna. Because I had my back turned I never realized that Sir Paul McCartney was walking over. Obviously he loves the pipes after Mull of Kintyre and his time spent in Campbeltown. He said to me, who’s that on the phone and I told him, it’s my wife, so he asked to speak to her. Now you really have to put yourself in her shoes because she’s standing doing the ironing in Glasgow and the next minute she’s on the phone to Paul McCartney. He said that he liked her name and that Anna was a Beatles song. She still dines out on that story to this day. Michaela: Alongside your charity album, ‘343 The Fallen’, have you taken part of any other charitable events or activates? Willie: Yes. A lot actually. For my 50th birthday and just before I retired from being a fireman we played a charity concert in Glasgow at a wonderful venue in the city (which ironically burned down); we raised £50,000 and gave it to fire service related charities. I think it’s important to help out where we can. It keeps everyone grounded and humble. Michaela: What would you like to say to those that will be attending the show and to those that are still deciding to go or not? Willie: It’s more than just bagpipes. We have a brilliant lighting technician with us and that adds to the visual aspect. When the bagpipes are being played, they are being played by world class pipers. We always take the audience very seriously and it’s all about them. We never let anyone down; try and catch the show before we’re really massive and the tickets price goes way up.